Creativity has always been a touchy subject for me. While I come from a family of ridiculously artistic women, I can’t draw, dance, paint or sing. For the longest time, I figured the C-gene skipped me, and I sort of grew to be fine with that. (Sort of.) As I got older, I realized that creativity exhibits itself in all kinds of different ways. (Duh!) I’ll probably never ever like being on stage or able to harmonize worth a darn, but shoot, I can dream up marketing ideas for days, whip up a meal out of whatever scraps are in the fridge and always find the bright side of any bad situation…and that counts for something! So, when I got my hands on very first edition of C.L.A.P. (Creative Ladies Are Powerful), I couldn’t help but get excited as I read it cover to cover. The zine, created by Holly Hilgenberg and Lisa Luck, sets out to celebrate women in all forms of creative living, not just the (somewhat limited) realms of visual, literary or performing arts. Teachers, writers, educators, nonprofit folks, hair stylists and artists are all welcome as contributors—and the resulting publication is fresh, fun and exciting. Retailed locally at Yeti Records and Everyday People, the first issue is packed with inspiring creative exercises, articles, recipes (vegan marble cake! 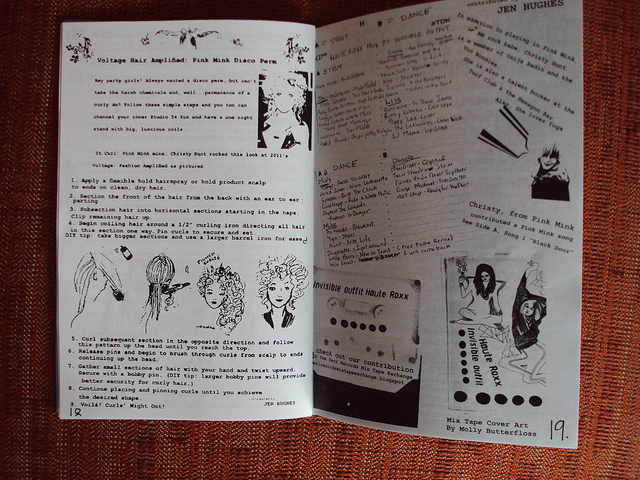 ), illustrations, jokes, how-tos (disco perm anyone? ), playlists, quotes and cheap and easy DIY ideas. C.L.A.P. originally started as a creative women’s collective in spring of 2007 by several of my lady friends and me. It sort of fell to the wayside for many of the women involved, but I kept trying to do things like craft nights (and I don’t even like crafts!) to have an excuse to get ladies together in a creative capacity. Last year, I returned to the idea of C.L.A.P. and thought it would be interesting/fun to start the group up again, with more of a focus on supporting creative women. I was finishing up my Masters degree at the time and my main partner in crime on this project, Lisa Luck, was preparing for her wedding and opening up Yeti Records with her soon-to-be husband, so again, C.L.A.P. was put on hold. 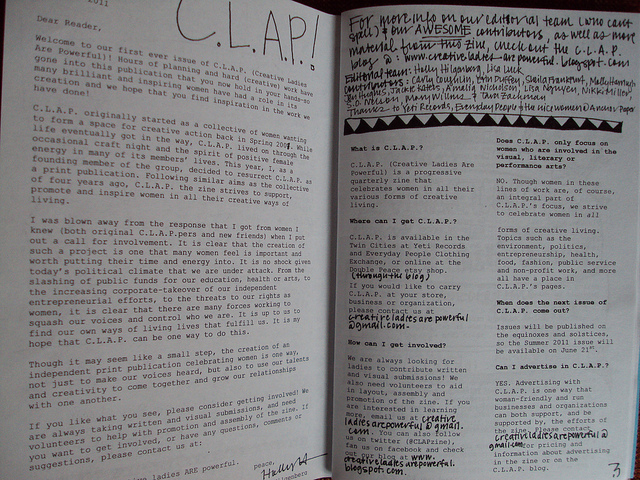 Over this past winter, Lisa and I would meet and talk about our various creative endeavors and seeing a local music zine at her shop sparked an idea in me—we should restart C.L.A.P., but as a publication. I love independent publications and magazines and have always wanted to start my own, so it seemed like a perfect fit. I put out a call for submissions from the ladies I knew around town and was amazed at the interest in the project. Ladies were definitely excited to have a space to share their knowledge and experiences and to have an outlet to express themselves. 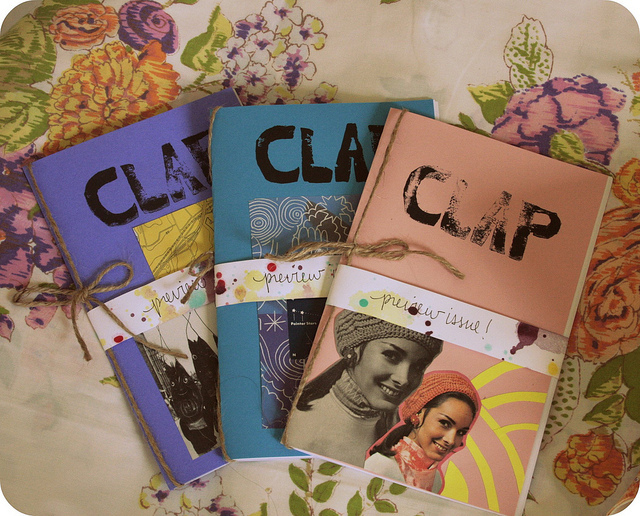 Though I want to grow the publication in its reach and it’s presentation, it is really important to me that C.L.A.P. is a welcoming space for ladies that want to share their stores. It is also worth noting that the focus of the zine is not just on women involved in traditionally creative fields such as the visual, literary and performance arts, but also includes women who utilize creativity in other fields like teaching, nonprofit and entrepreneurial work, food, etc. Interior photos courtesy of C.L.A.P. Want to win one of two copies I’m giving away? Of course you do! To enter, leave me comment telling me about a recent creative accomplishment. (For an extra chance to win, tweet or blog about the giveaway and enter the link to your tweet/blog in a separate comment!) To read excerpts from the issue, order copies directly or learn about subscriptions and submission guidelines, visit C.L.A.P.’s website here. I’ll be picking the winners on Friday, so get on it!! This entry was posted in Uncategorized and tagged C.L.A.P., creativity, girl power, giveaway, zine, zines by highplainsthrifter. Bookmark the permalink. I made a vegan chocolate cake! Its not creative in an artistic way, but I creatively reused a marinade for a yummy dinner tonight. I am learning to knit!!! In the not too distant past I made a deeelicious beer-chicken-veggie-noodle soup! Wine sauces!! I’ve been making all sorts of wine sauces for dinner on the whim, a dash of this – a splash of that! It’s been the most fun!! One more for good luck – I’ve been singing my very own lullabies to miss zora!! If I win I will submit one for the blog!!! I make my own face masks and make yummy vegan/vegetarian meals.